Israeli living in Britain discovers Israel leases brand globally due to local produce decrease. Is it lost for good? Oranges are no longer the top Israeli export product, but most of us still hold a soft spot for the orange delight, especially when we see it sold abroad decorated with the famous green sticker - "Jaffa". Shai, who lives in Britain, is always happy to run into Jaffa oranges at the Tesco grocery store near his house. Just recently he bought, as usual, a package of oranges with the green sticker from the famous brand name. But after finishing the crate he discovered the writing on the box said: Spanish Jaffa Orange. As it turned out, the Jaffa oranges were in fact grown in Spain, one of Israel's biggest competitors when it comes to the golden fruit. "Is the Israeli brand name, Jaffa, gone for good?" Shai told Ynet. "Was this icon, that's so identified with Israeli agriculture, sold to the Spanish farmers?" Tal Amit, Israel's Citrus Marketing Board director reassured: Jaffa is still in our hands. "We're leasing the brand to the Spanish," he explained. "Israel is producing fewer and fewer oranges, but we wish to keep our brand going strong, and in Britain it's very popular." Indeed, the British are very well aware of the Jaffa brand. If you say "Jaffa" to a Briton he will smell an orange. It's synonymous. The British call every orange, even orange candy or cake – Jaffa. The name goes hand in hand with quality branding. The pairing of Jaffa with quality citrus fruits is not overlooked by the Tesco grocery stores, which have decided to brand all oranges they sell under the Jaffa name. Due to the fact that the original Jaffa is Israeli and the branding rights belong to Israeli growers, Tesco signed a deal with the Israeli fruit exporters. "The cooperation with Tesco began in 2003-2004," Amit said. "The network agreed to sell a line of Jaffa products exclusively. It's the only external brand, other than Coca Cola, sold there. Tesco sells only private brands." Four elements are part of this collaboration: The Citrus Marketing Board in the Plant Council; exporters of Israeli fruit Agrexco and Mehadrin Tnuport Export who are currently behind 85% of Israeli exports; Tesco and Tesco's category manager, who is an external official working with the chain. "According to the deal, which has been successfully working for the past seven to eight years, we brand fruits that aren't made in Israel as Jaffa as well, on the condition that they are of high standard quality and in return we receive royalties," explained Amit. "The idea is that the brand gets exposure for all 12 months of the year, even during a season we don't have fruit." It all started with citrus fruits from South Africa and South America which were branded as Jaffa during the months of May through November, months when there are no orange exports from Israel. In the last couple of years, these foreign fruits fill the gap more and more, a gap that was created in the Israeli market. "Even during the season we have gaps," admitted Amit. "We can't keep the line going on the shelves, so we allow the foreign competition to enter the chain in limited amounts under our brand name. These fruits are not competing with our fruit because we have nothing to market against it. What the Israeli living in Britain saw on the Tesco shelves is an 'umbilical Israeli orange', which we haven't been exporting for years." The growers also benefit from the situation. "For every cart that's not exported from Israel we receive royalties," explained Amit. "From this deal we got over NIS 1 million ($280,000). Besides that, Tesco is obligated to spend nearly the same amount on advertising the brand, which saves us money we would have used to invest in the brand. They hold a lot of sporting events under the Jaffa brand name, especially sponsorships for sporting events, boating, basketball, soccer, and sporting events with Queen Elizabeth." Ever since the council was privatized, almost 20 years ago, marketing and exporting was performed by private factors, but the council continued to preserve the brand. Behind the Jaffa brand stand many investers who have been funding it since it was established over 60 years ago. "Renewing the brand registeration and its commerciality in all the countries cost a fortune," said Amit. "However leasing the product doesn't hurt it but rather makes it stronger. This is a marking move which contributes a lot to the citrus branch in the State even though some of the fruit originate from other places." 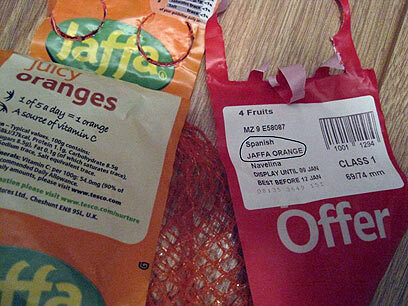 See all talkbacks "Jaffa oranges - made in Spain"